The Combined Congress 2014 of the four crop and soil societies of South Africa (SSSSA, SASHS, SASCP and SAWSS) took place from 20 to 23 January 2014 at Rhodes University, Grahamstown. The theme of the congress was “Promoting Sustainable Agricultural Production Together”, aiming to bridge gaps between academia, industry and government. Keynote speakers from the fields of Crop Science, Horticultural Science, Soil Science and Weed Science addressed the theme on the first day of the congress. The congress welcome function marked the beginning of a busy and successful week which had a record attendance of 388 delegates from all over the country. Six delegates from the Monsanto/Research Solutions team attended the Combined Congress this year: Dr. Juan Vorster, Jaco Snyman (Research Solutions), Riaan Rossouw, Martha Okumu, Muntingh Hamman and Wendy Malatji. Prof. Reinhardt could not attend due to health reasons. All the students in the team presented orally and two managed to win awards from the Southern African Weed Science Society (SAWSS). 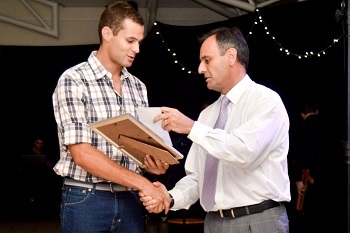 The SAWSS/Syngenta award for the best paper presented by a student in the field of Weed Science during a congress was awarded to Muntingh Hamman. 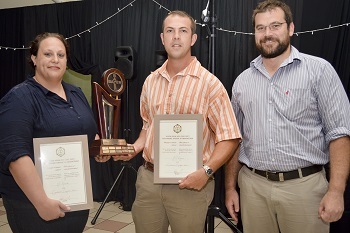 Riaan Rossouw and Heista Nienaber both received the Bayer Herbicide Resistance Management Award. For papers presented by the Monsanto/Research Solutions team at the Combined Congress 2014, click here.